When you think of Bali, you probably think of beautiful beaches, awesome green rice paddies and, of course, delicious food. Bali has got it all and, as foodies, we are absolutely raving about the fantastic restaurants, inspiring cooking styles and local dishes available on the island. We absolutely love to explore the island for the best Bali street food available and in this street food guide, we share our favorites. From tender sate and rich beef rendang to sweet fresh fruits and delicious desserts: get your appetite on! In this article we talk about hawkers and warungs, but what is the difference between these two? 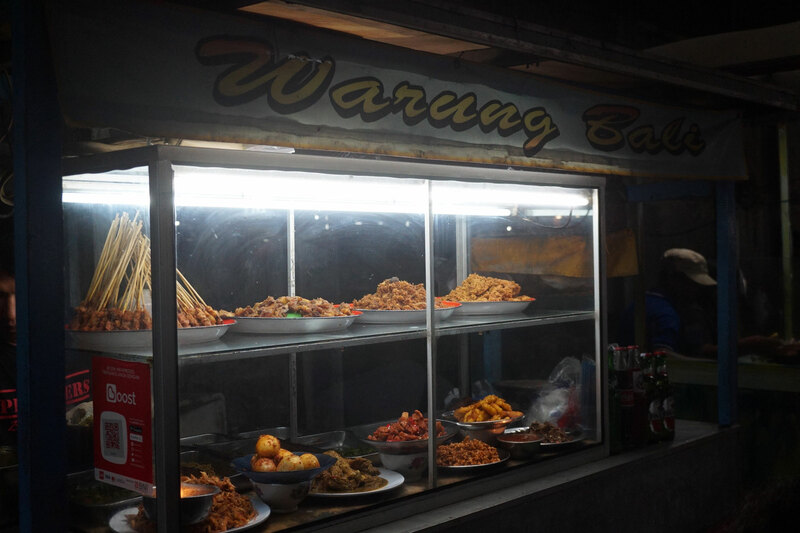 A warung is a local eatery with a physical location which is run by a family and usually serves several local dishes. There are warungs that only serve local dishes from Java, Bali or from Sumatra island, but many warungs also serve a mix of all these dishes. A hawker, on the other hand, is traveling around with a food cart selling his food on the street. 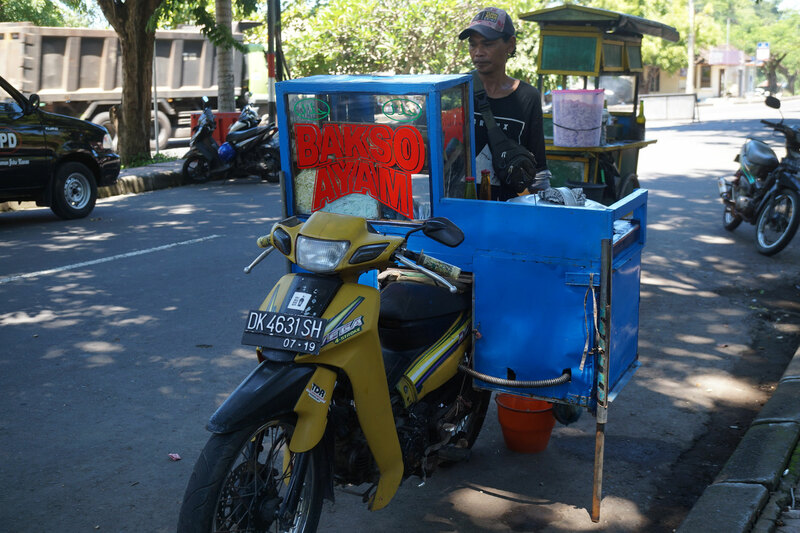 A hawker is specialized in one disch: sated, bakso, mie gorent, etc. etc. You might find the same hawker on the same spot every evening and perhaps he or she even has some stools for you to sit on. Babi guling, also called suckling pig, is one of the most famous street food Bali dishes. The majority of the Indonesian residents is Muslim and can’t eat pork, but it is a different story on Bali! The main religion on Bali is Hinduism and babi guling is a delicacy, eaten throughout the island. Suckling pigs are young pigs roasted in its whole on a spit over an open fire. The meat is tender and full of spices, like lemon grass, garlic, ginger, kukurma and pepper. 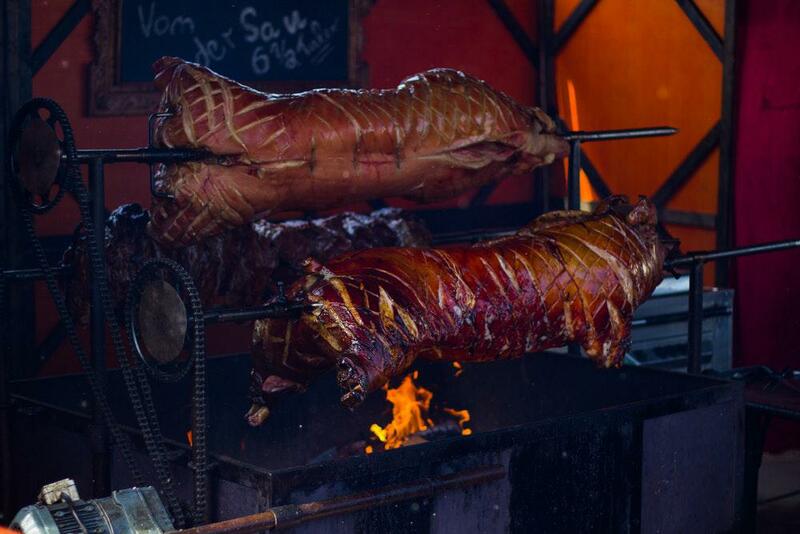 The meat is roasted over an open fire which will make the skin extremely crispy. The Balinese consider this a delicacy, which we totally agree on! The meat is white, soft and very tender and the skin has a perfect crisp. Babi guling is served with fresh green vegetables, salad, nasi putih (white rice) or nasi goreng (fried rice) and sambal. Did you ever hear of bakso! Bakso are Indonesian meatballs and a highly popular street food dish all over Indonesia. You will find vendors everywhere selling this popular dish on the street, but you will also find it at warungs and 5-star restaurants. Bakso is meat made out of very finely grounded beef and mixed with tapioca flour and salt. This is just one variety of bakso. You can also eat bakso made out of chicken, fish, shrimp or tofu. The ingredients depend on the bakso seller and how he prepares the dish. Bakso is often served in a broth with noodles, prawn crackers, bean sprouts and boiled egg. Bakso is mostly sold by hawkers. The vendor will announce himself by tapping a metal spoon against a soup bowl. This way people in the area know he is on his way with some deliciousness! Oh, don’t you just love a good tender sate on a skewer, with some delicious Balinese peanut sauce and some pickled veggies? 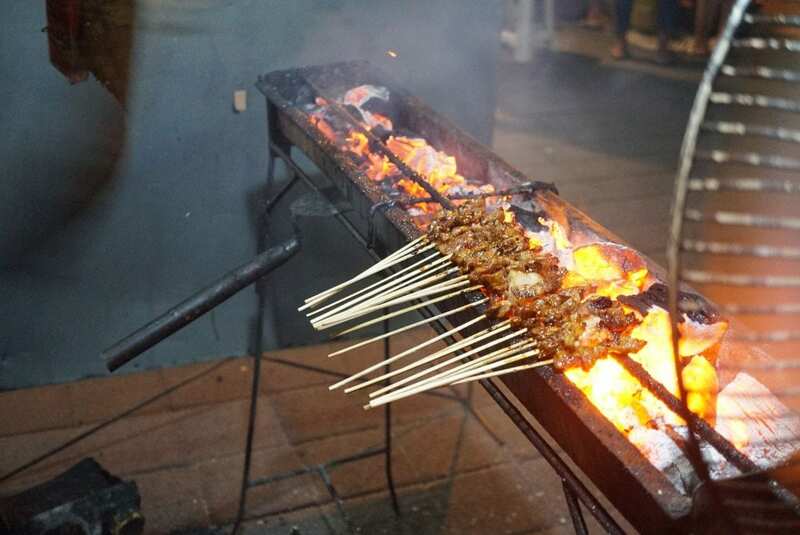 There are many different kinds of sate available on Bali; sate ayam (chicken), sate babi (pork), sate daging (beef), sate ikan (fish) and sate kambing (goat). If you prefer vegetarian, you can order sate tofu or sate tempeh. Sate really is the best Bali street food there is! Lilit in Indonesian means ‘twisted’ because the meat is wrapped around the skewer (very often a piece of lemon grass to give the meat a fresh flavor). 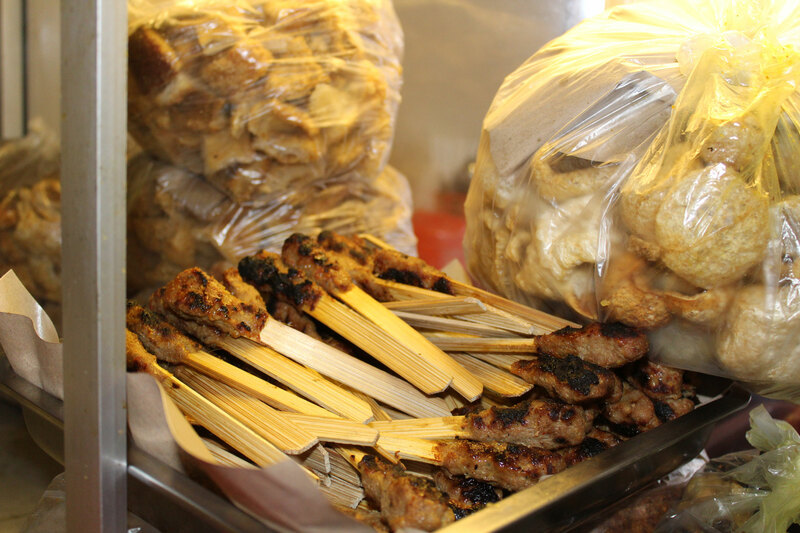 Sate lilit can be made of chicken, beef, pork or fish. The grounded meat or fish is mixed with a tasty mixture of grated coconut, coconut milk, chilies, kukurma, sambal and spring onions. The sate is then grilled on the BBQ. In Indonesia corn on the cob makes a delicious street food dish! Are you relaxing at the beach around sunset and you feel like a cold beer and a snack? Sweet corn will do the trick! You won’t have to look around for long around dawn to find a hawker selling this tastiness. 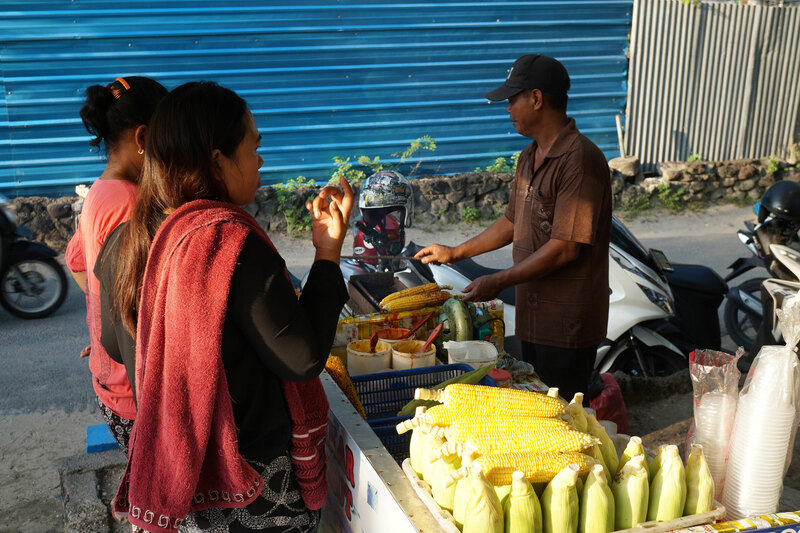 Especially when you’re in Kuta, Legian or Jimbaran you’ll find sweet corn vendors everywhere. Drizzled with some melted butter and spicy herbs, you can’t go wrong with this deliciousness! Nasi campur is the best dish for when you have no idea what to choose because it all looks so yummy! Most warungs offer nasi campur on their menu. It basically is a plate with nasi puti (white rice), nasi kuning (yellow rice with turmeric and boiled in coconut milk) or red rice. When you’ve chosen your rice, you can select your side dishes and what a treat that is! Side dishes can vary from sate, tofu or tempeh in spicy sauce, a boiled egg, different kinds of stir-fried veggies and boiled veggies, you name it! A lot of warungs have at least 10 dishes to choose from. Still not satisfied? Very often you can order an extra snack, like deep-fried corn fritters or eggrolls. You serve Nasi campur with sambal, spicy pickled vegetables and prawn crackers. 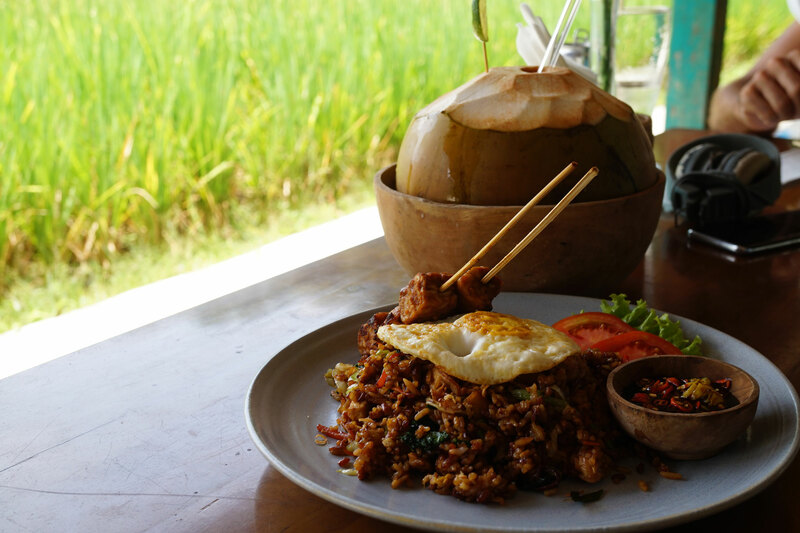 Perhaps this is the most famous Indonesian dish of all: nasi goreng, alias, fried rice. You can order this delicious Bali street food dish at almost every street corner and warung. This dish is served either with nothing extra or it is served with everything. From a fried egg to prawn crackers and from a sate skewer to pickled vegetables. Since it is so easy and quick to cook up this dish with leftover rice, many Balinese have nasi goreng on a daily basis. And why not, it is just so tasty! Nasi Goreng is nothing more than leftover white rice (preferable from the day before) stir-fried with either meat or shrimp, veggies and seasoning. 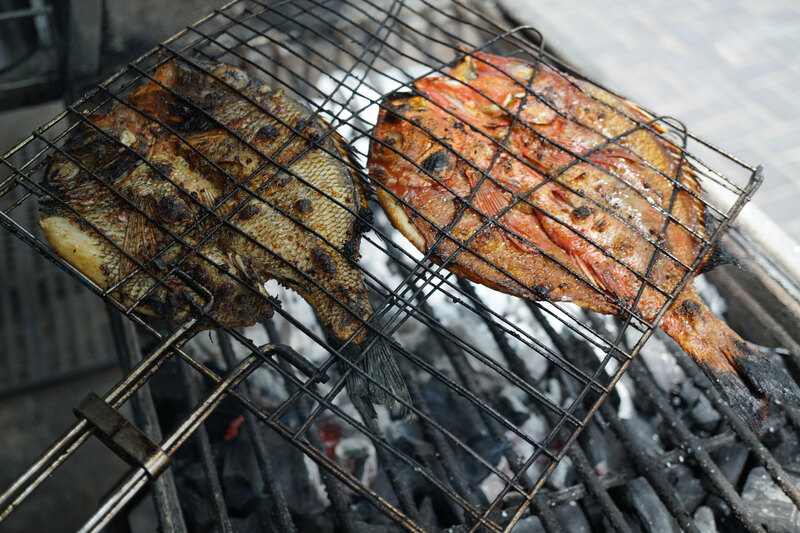 Another perfect Bali street food dish is Ikan bakar (charcoal grilled fish) and the best you will find in Jimbaran, in the south of Bali. 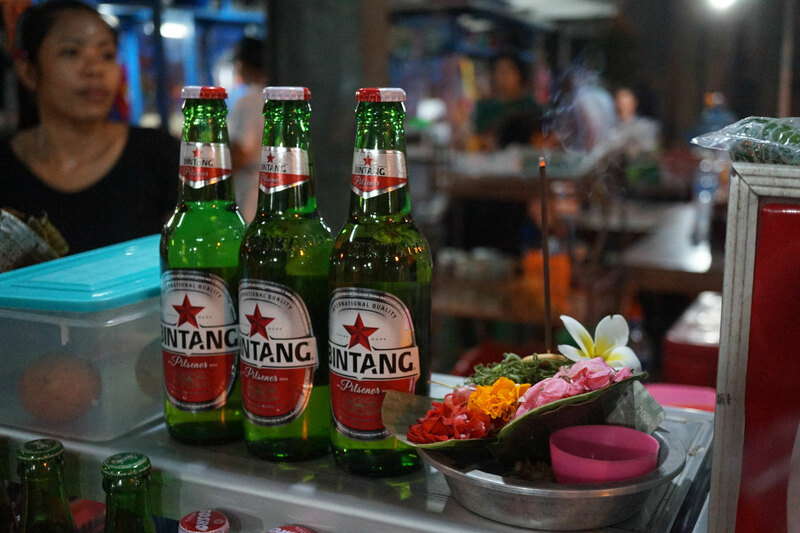 Combine this dish with a bintang and a perfect sunset and you’ll have the best local experience ever. Depending on the season and you’re location, the fish is either a river fish like gurami or something like a snapper. It is seasoned with a tasty spicy marinade and put on a hot BBQ. When you think of street food on Bali, you don’t instantly think of fruit. But oh boy, what a treat the fruits on Bali are! Delicious, sweet, strange looking, smelly (that’s right!) and different from the ordinary apple or orange that you eat at home. Let us explain to you some of the delicious fruit you can find on Bali. The English name for salak is snake fruit. The red-brownish peel looks like the skin of a snake and that’s how it got his name. The skin is very easy to peel and inside you will find 3 pieces of fruit. 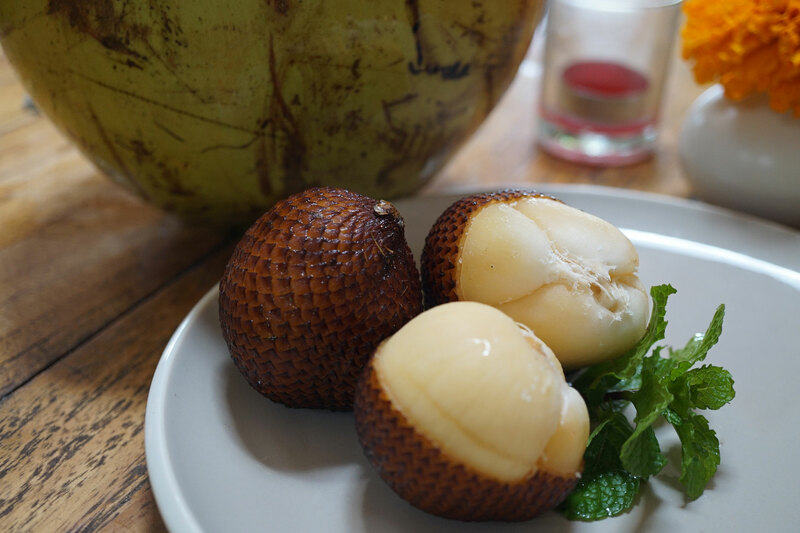 Salak tastes sweet and sour, is very juicy and also crunchy. A definite must try! 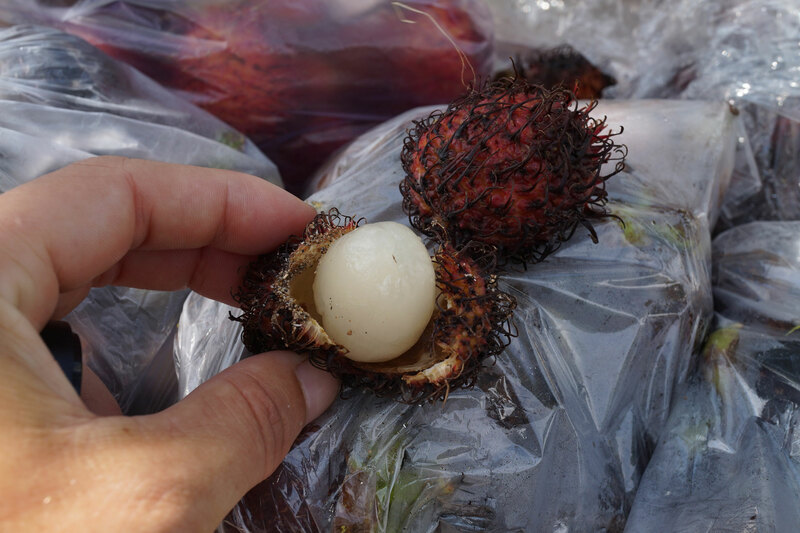 You can easily recognize rambutan by its pink colour with long ‘hairs’ on it. And that is also exactly what ‘rambut’ means in Bahasa; hair. The fruit is very easy to peel and from the inside it both looks and sort of tastes like lychee; fresh and sweet. Rambuntas grow in trees in the Balinese countryside. You know when the fruit is ripe when the colour is pink and the skin is easy to peel off. 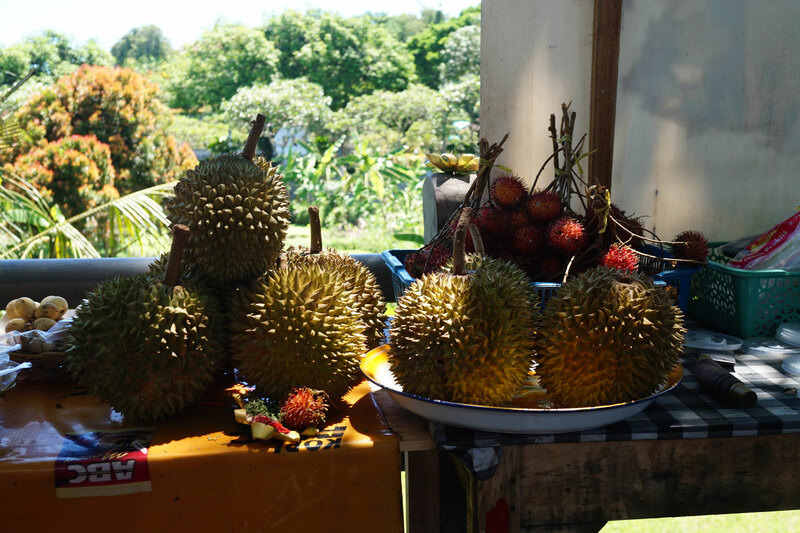 The durian is a notorious fruit all over Asia because of the smell. In many hotels, restaurants and even subways in Singapore and Kuala Lumpur, durian if prohibited. You can easily recognize durian because of its spines. Even though it smells bad and also the taste is nothing like you have tasted before, the fruit is pretty popular amongst the locals. You can even buy durian chocolate and durian candy! You either hate or love this smelly fruit! Do you dare to try? Sirsak or soursop is a very sour fruit and grows near bananas and pineapple. The fruit is green and has the shape of a pear, but with spines. The inside of sirsak is white, soft and meaty but also a bit jelly-like. The taste is both sweet and sour at the same time. 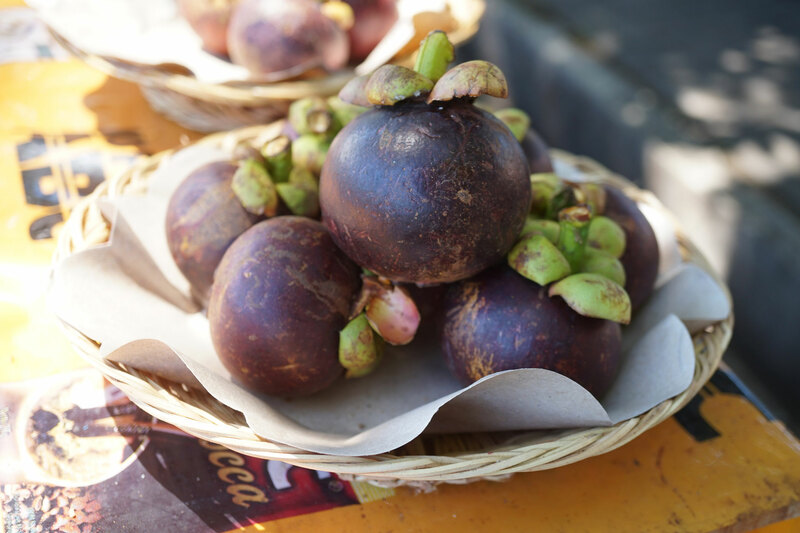 Mangosteen is a round fruit with a distinctive purple skin. Inside the fruit looks a bit like a white mandarin with a fresh and sweet taste. Delicious! Be aware that the skin is quite hard to peel and the juice leaves purple stains on your hands and clothing, so be careful peeling it. Oh, there is nothing better than a nice bowl of delicious hot beef rendang with some rice and fresh veggies. Originally rendang is a typical Minangkabau dish from the island of Sumatra. There it was served during ceremonies. You will still find the best rendang in Padang, in the western part of Sumatra island but on Bali you will definitely find some too. Rendang is an Indonesian beef stew with grated coconut and spices and one of the best street food Bali you will find. In 2011 it was named the best Indonesian dish and we couldn’t agree more! You should absolutely try this dish! Who hasn’t heard of soto ayam, Indonesian chicken soup? Healthy, hearty, warm and full of flavour. This soup is made with chicken broth, a delicious mix of spices, pieces of chicken, vegetables like celery and bean sprouts, a boiled egg and crispy pieces of onion. There might also be some potato in it, noodles or longtong (pieces of compressed rice). The trick is all in the bumbu (the spice mix) which gives the soto ayam its tasty flavour. Top the soup off with some sambal and crispy deep-fried onions and street food on Bali doesn’t get any better than is! When you’re ordering food on Bali, your food will be served with 2 sauces: the spicy classic sambal and/or sambal matah. Sambal matah means raw sambal and is made with raw spring onions, red rawit chili peppers, lime leaves, shrimp paste and lemon grass. Sambal matah is typical Balinese sambal and obviously combines very well with a lot of the delicious street food you will find on the island. Do remember that it is very spicy, just so you know! You can eat martabak both as a sweet dessert and as a savory dish with egg, onion and meat. The sweet version, martabak manis, is a thick pancake with inside a sweet filling. The filling can vary from chocolate and peanuts to honey and banana. Every street vendor on Bali will sell this deliciousness, mainly in the evening when people have had their dinner and are looking to satisfy their sweet tooth. 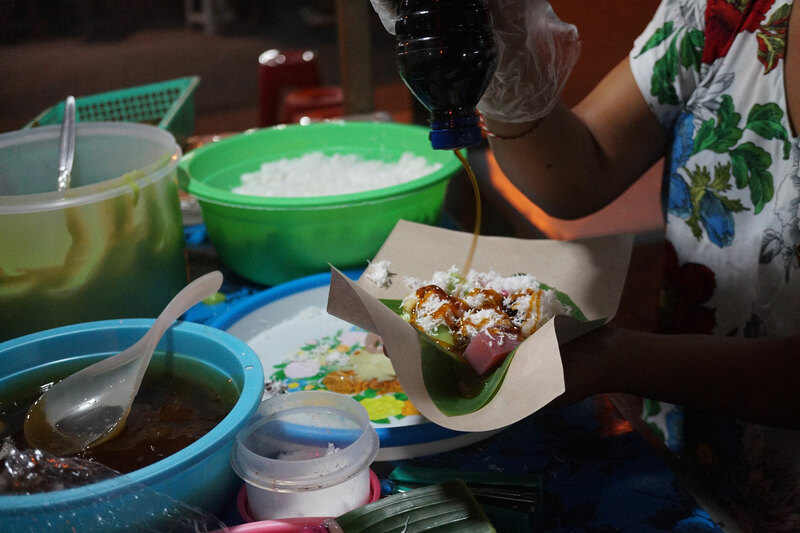 When you crave something sweet and filling after your street food dinner, martabak manis is your best friend. Bumbur Menggu is delicious Balinese comfort food: rice cooked in coconut milk. It is topped off with several ingredients like pieces of grilled chicken with bay leaves and galangal, green beans and peanuts. A sauce made out of hazelnuts, spring onion, pepper, coriander, turmeric and onion will finish it off. The more coconut the street vender uses, the creamier this dish gets. Made from rice flour, Jaje has either a white or green colour and is covered with shredded coconut and brown sugar sauce making the dish nice and sweet. It’s the perfect dessert to go with your cuppa after a delicious meal. 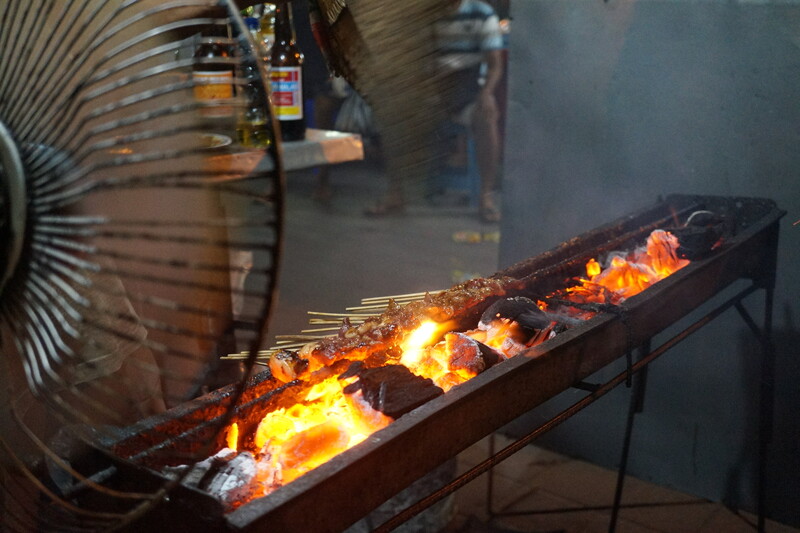 Street food Bali leads to Bali belly…? Just a little warning here as we know many people question the freshness and quality of street food. Worried that all this street food leads to food poisoning like Bali belly? To prevent getting sick from any Bali street food, make sure you only go to warungs and hawkers where it is busy with locals. When it’s busy it means there is a high turn over which leeds to using fresh ingredients. 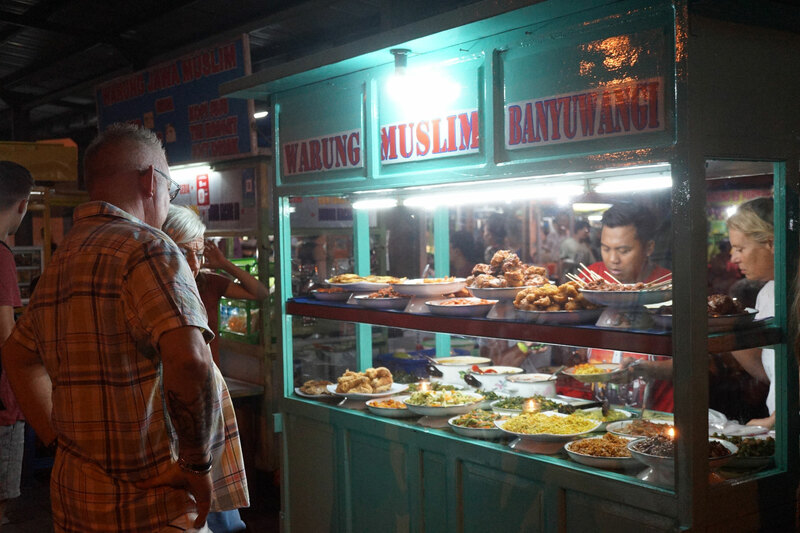 When you see locals eating at a hawker or there is a waiting line at a warung, you know you’re safe! Did this street food guide build up an appetite and you want to make sure you eat your Bali street food at the right hawkers and warungs? Why not book a Bali street food tour with us! 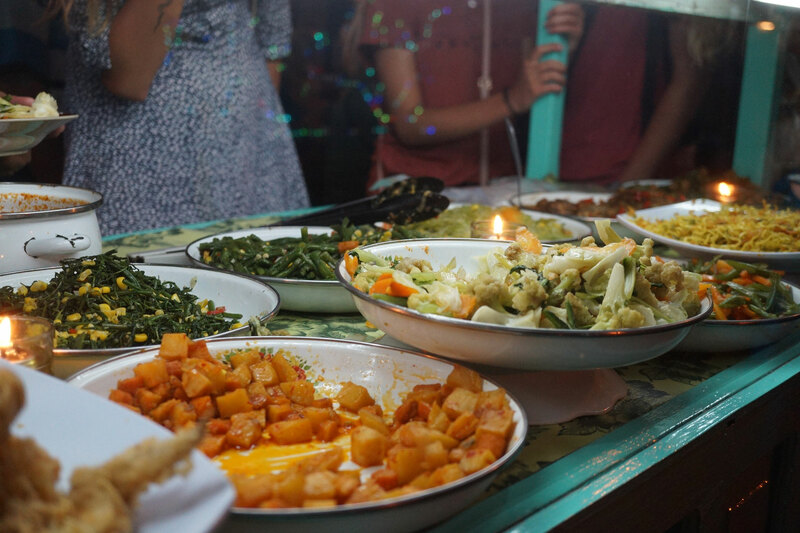 We will take you to the best local warungs and hawkers on Bali where you will taste and enjoy Balinese food and will learn a bit more about it. Check all our food tours Bali!